As of 1.5, we introduced Decorator pattern to our Behat architecture in order to facilitate maintenance and new tests development. 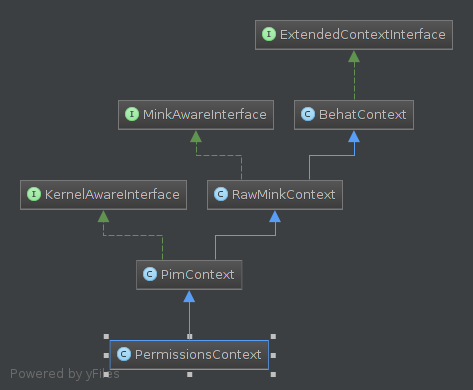 To explain how our architecture works, let’s take permissions in the system menu as an example. Given I edit the "Catalog manager" Role # Change the current page and ask to Selenium to open it in the navigator. And I grant rights to group Products # Here we do the action to grant rights. Then I should not see the text "There are unsaved changes." And I should not see "Change status (enable / disable)"
Here we describe what happens if we revoke rights to change state of products to a user in the catalog manager role group. Given I edit the “Catalog manager” Role With this line we change the current page to be on “Role edit”. // "Role edit" is now our current page. The current Page is the one we are working on. // navigator thank to $path containing in "Context\Page\Role\Edit". Selenium will know which URL to go to thanks to the protected $path attribute contained in Context\Page\Role\Edit. You may notice that this Gherkin method still uses the old implementation of Behat in Akeneo PIM. All our new contexts are in the namespace \Pim\Behat\Context\Domain which is classified by domain. Each domain is linked to a page in Akeneo PIM. That’s why, in this namespace, you will find the same architecture as in our main menu. This organization is very helpful to quickly find the context you are looking for. 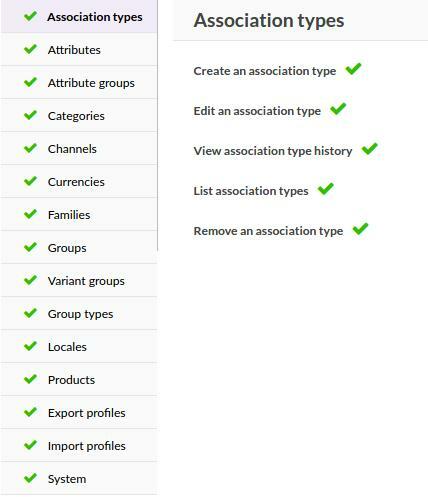 We are working on permissions that are localized in the system main menu. So let’s see the \Pim\Behat\Context\Domain\System\PermissionsContext. // In the previous step, we put the current page to "Role edit"
The current page is Context\Page\Role\Edit. When you call Pim\Behat\Context\NavigationContext->getCurrentPage() the method will match “Role edit” to return new Context\Page\Role\Edit(). That’s why all of our pages are located in a folder named after the name of the Entity. In this folder, each action has its dedicated page such as Index.php, Creation.php, Edit.php as you can see in the Role folder for example. Decorating this Element has added behavior from the PermissionDecorator on it. Now the Element will be able to know how to grant or revoke permission to a group or a resource and navigate through groups. That makes the Page very readable and clean as the code is dispatched into several methods inside single responsibility decorators. As Pages are only for decorators configuration purpose, note that in the future they will be removed and replaced by a real configuration system. We never add logic in Pages. All decorators are classified in the tests/legacy/features/Behat/Decorator/ folder. Each sub-folder represents the element that it decorates. You can find inside folders like Completeness, Field, Tab or for our example Permission. The name of the sub-folder is only the representative name of the element, no prefix, no suffix. Also, decorators classes have to be suffixed by “Decorator” like DecoratedElementDecorator. The Pim\Behat\Decorator\Permission\PermissionDecorator adds behaviors to an Element to be able to navigate between groups and grant or revoke permissions for resources or groups. That’s how we can call methods from the Element class inside decorators. And obviously, that’s why all decorators must extend Pim\Behat\Decorator\ElementDecorator. You can see that in the ElementDecorator a decorate() method exists. 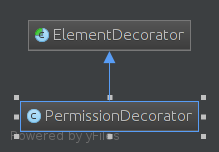 It is possible to use it to decorate an Element in your decorator. In this example, it could be possible in the PermissionDecorator to create a GroupPermissionDecorator to regroup all behavior about groups menu (the left menu in the previous picture) and a ResourcePermissionDecorator to regroup all behavior about resources (the right panel in the previous picture). Now, let’s see what happens when grantGroup() is called from our context. To learn more about spin, please refer to the spin chapter. You may notice that all logic of the element research is located in decorators and is spinned. If we had several identical permission panels in different pages, each page would have to use the same decorator. That’s why, decorators have to be generic. In case an element differs from one page to another, use a decorator for those elements and implement same methods the way you need.